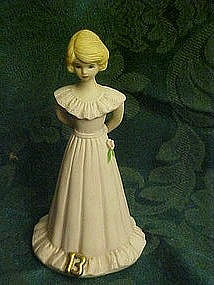 Pretty hand painted 13th birthday girl figurine by Enesco. One from their growing up girls series. She is 6 1/4" tall and is in perfect condition. She wears a delicate pink dress with a small rosebud on the side. She had pretty blonde hair and wears the #13 in gold on the base of her gown. Dated 1981.